Successive governments did show some fiscal rectitude. While Brussels’ target has been postponed – from 2014 to 2015 to later, maybe – the structural deficit has shrunk by 1 percent of GDP each year since 2010. That is a brutal adjustment. There have been too many tax hikes and too few spending cuts, but the results are there. The main one is that France’s economy, as the whole euro zone, is reeling from the mindless austerity that served as Europe’s only policy in the last three years. And the Brussels-manufactured recession has made it almost impossible to introduce the reforms the country needs – like liberalising services, or taming the bloated state machine. Like Spain – another country that will miss its “target” – France needs growth to reform, and reforms to grow further. But it can’t do that in a fiscal straitjacket. French yields are historically low and the country funds itself at cheaper rates than the UK or the U.S. According to some indicators, the country’s competitiveness has stopped eroding, and it is regaining global market shares at last. A growth-reluctant economy and a weak government are already huge challenges. 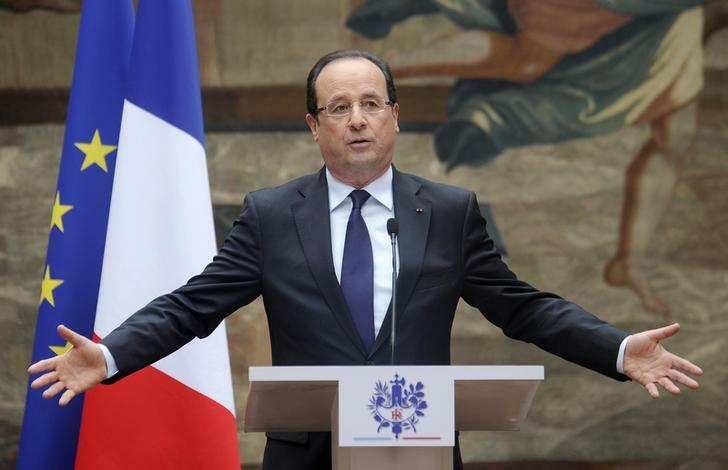 France doesn’t need an artificial, arithmetic and absurd fiscal target on top. French President Francois Hollande attends a ceremony for the Working Medal of Honour to mark Labour Day at the Elysee Palace in Paris May 1, 2013 . France’s budget deficit will shrink from 4.1 percent of gross domestic product this year to 3.8 percent next year and 3.7 percent in 2015, the European Commission said on Nov. 5 in its autumn economist forecast. The French government had previously pledged to bring the deficit back to the EU-wide limit of 3 percent of GDP in 2015. The EU said the country’s GDP would grow 0.9 percent next year, in line with the government’s forecast, and 1.7 percent in 2015. Average growth in the euro zone is seen at 1.1 percent in 2014 and 1.7 percent in 2015. France’s unemployment rate will rise from 10.2 percent this year to 11.3 percent in 2015, the EU also said.